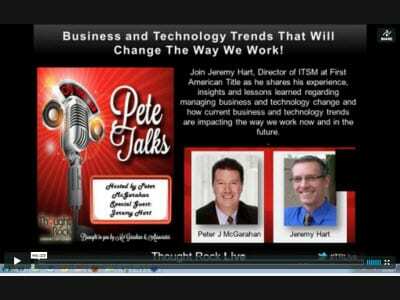 Webcast Followup > “Pete Talks” Business and Technology Trends That Will Change The Way We Work! Rapid and breathtaking technology advances are forcing radical changes in how service and support organizations function. This includes their culture, leadership, and even careers. Global business and social trends, as well as technology spending are driving organizations to accelerate their organizational change plans in order to survive and thrive. They must plan for complete transformation – strategy, structure, people, process, and tools. Are we preparing our professionals to plan for and execute these changes? Are we helping them position themselves and their organizations for success in this dynamically evolving world? The urgent and undeniable need for professionals to examine their skill sets today against those required tomorrow. The significance of industry and business changes as they radically impact IT organizations, cultures, professionals, and careers over the next five years. Recent game-changing developments, including cloud computing (hosted services and software solutions), the virtual desktop, mobile computing, IT sourcing, and remote / virtual workers.